Great performers always have their loyal fans, because, after all, music is better live. Its for this very reason that Soulive is still going strong and just released their sixth studio album, No Place Like Soul. However, will this new album, the first with lead singer Toussaint, change Soulive's place within the industry? Regardless both drummer and de facto band leader Allen Evans and Toussaint don't seem worried as they took some time to interview with MVRemix. MVRemix: Hey, how's it going? MVRemix: Thanks for taking your time. So which number album is this? The sixth? Allen: Definitely more than that. You know, I don't even know. MVRemix: I guess you guys are pretty relaxed. MVRemix: Compared to most artists I interview. Toussaint: Laid back, baby. Can't be no other way. MVRemix: You guys are mostly famous for being a jam band. Is it harder for you guys to go in the studio and translate that feeling onto a record? You know what I'm saying? Allen: Not really because we've never even tried to. It's like, for me, the studio is a beautiful place to just experiment, and we use that as a vehicle to be able to go other places where you can't go in a live show. And the live show, you do things that you can't do in the studio. They're just two completely separate things, in my mind. Toussaint: Yeah, yeah, yeah. At least for us, it's just easier. It's just easier that way. Also, what's the point of recording something exactly what someone's going to get at the show, they walk out and it's the same. You're trying to give them the same experience. I just like to offer different sides of us. MVRemix: That's interesting because I always felt like groups like The Roots too- are you familiar with their stuff? Allen: Oh yeah, of course. Yeah. MVRemix: Things Fall Apart- I didn't like that album too much, but then when I saw them live, I was like ohhhh! They played some of those songs. I was like �I get it now�. You know? So you're saying when people listen to the album, they hear it one way, but when they see it live, it opens up a whole other mindset, vision. MVRemix: Okay. So are you guys working with anybody on this album? Allen: No, it's just the four of us. No guests or anything like that. Just a band, you know. MVRemix: How does the creative process work? Is it usually one person that comes up with more ideas or is it like a melting pot of creativity? Allen: I mean, for the most part, it's kind of hard to say. Really, there isn't one person who comes up with the majority of ideas or things like that. We all come to the table with ideas. In particular Aaron, Neal, myself have ideas mostly on the instrumental tip, not instrumental, but we came up with music. And then Trus came back with some amazing melodies and lyrics for the tunes. Then there were some tunes that already had lyrics and things like that, but again, even with tunes that already had lyrics that Trus didn't write, it was very important for us to have him put his thing on it. In the end, everybody's contribution to the music helps create the sound. Otherwise, you might as well do a bunch of solo items. 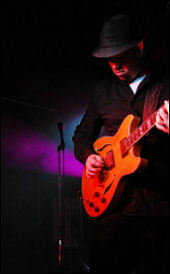 That's what the Soulive thing is- everybody has freedom to express exactly what they're feeling, how they feel in music. MVRemix: It sounds like you guys still enjoy it. It's not a business yet for you. How do you guys stay so close? Still enjoy the studio process with each other? Is there ever tension? Toussaint: I can't answer for the history of Soulive, but since I joined the group, I feel like, I came in August, and we initially did a 10 day run, like a trial run. The chemistry was so nice and we went into the studio and recorded the record, but during this process it's been just the energy of creating. Seems like to me anytime you do anything for such a long time, you get into a routine or whatever. And it seems like there's a new, like a fresh energy that we're all tapping into and we're loving it. That's what it feels like to me. You know what I mean? It's brand new again. Allen, I don't know what you would say to that. Allen: It's foolish to think that whenever you have four people or 10 people, whatever it is, together, all creative people trying to make something- music, or whatever, it's not going to be all good all the time. But that's alright because we're all family. Really in the end, there's compromises to be made and things like that, but in the end it's all about making good music. The thing is, I wouldn't be talking to you right now if I wasn't having fun. Yeah, true. It's a business, and I definitely approach Soulive as business. This is how I make my living. This is how I feed my family and everything. But at the same time, I love what I do. The day I stop having fun and loving playing music, I'm just done. I'm going to walk away, and not even think twice about it. It just has to be fun, or it's just impossible to be creative. Toussaint: You're right. Your creating comes from- and that book The Secret that everybody's reading- it says creating comes from joy. You know what I'm saying? That's where it's born of. You can't create unless you have joy. That's reality. That's dope. I'm glad you said that. "Really in the end, there's compromises to be made and things like that, but in the end it's all about making good music."